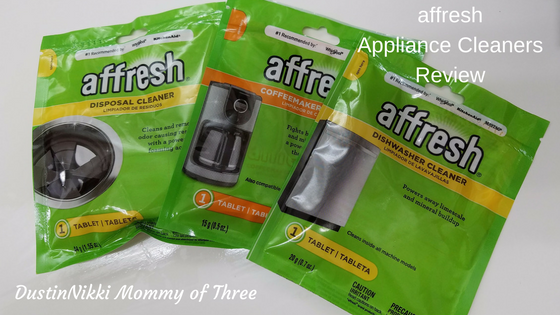 I am a Crowdtap member and not too long ago I received a sampling opportunity to try out some affresh Appliance Cleaners. If you don’t know what Crowdtap is, see the bottom of this post. For this sampling mission, I received three affresh product samples. I received Disposal Cleaner, Coffemaker Cleaner, and Dishwasher Cleaner. I couldn’t wait to put these cleaners to the test. 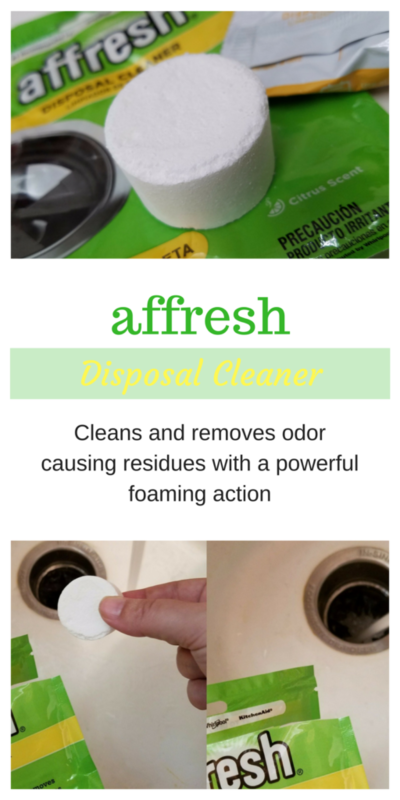 Affresh products are cleaners that are for a variety of appliances you have in your kitchen. They have cleaners designed for the inside of your appliances, and they also have cleaning products that consists of wipes and sprays for cleaning the outside of your appliances as well. 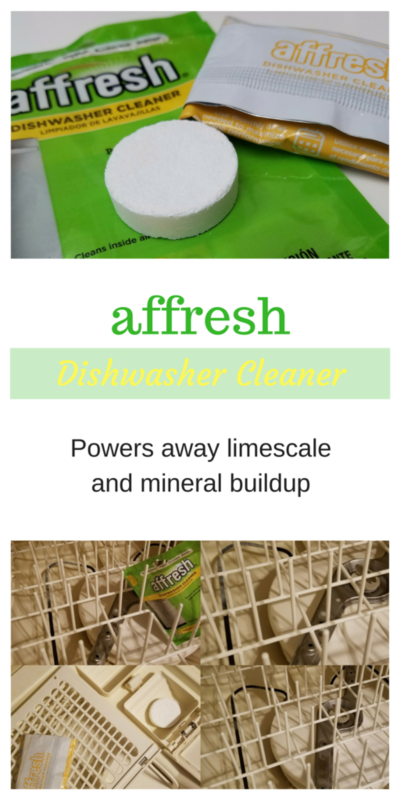 The first product I want to tell you about is the affresh Dishwasher Cleaner. These are tablets that are used inside your dishwasher. It is safe to use with all machine models. These tablets are meant to help remove limescale and mineral buildup. Every once in a while I will reach in my dishwasher and try to wipe out the buildup we get in our dishwasher. This has never been really easy to do. 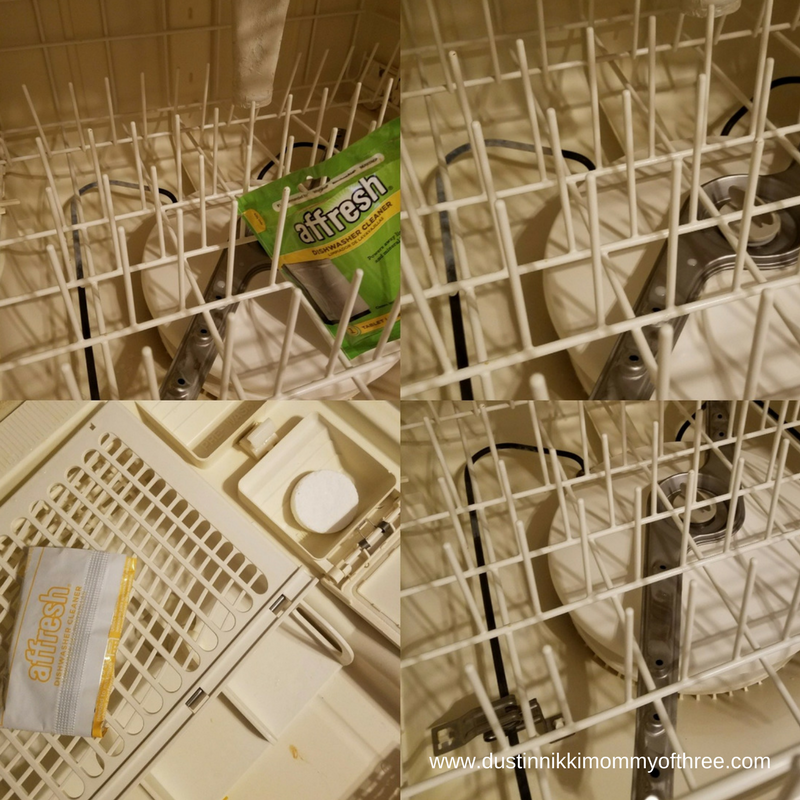 I never thought about a dishwasher cleaner before so I was excited to try this product out and see what it can do. This cleaner is really easy to use. You can actually use them while washing dishes too. You can clean it with or without a load of dishes. If you are cleaning with dishes, you would place a tablet in the bottom of the dishwasher. Not in the detergent tray. That way you can still add your detergent to your wash. 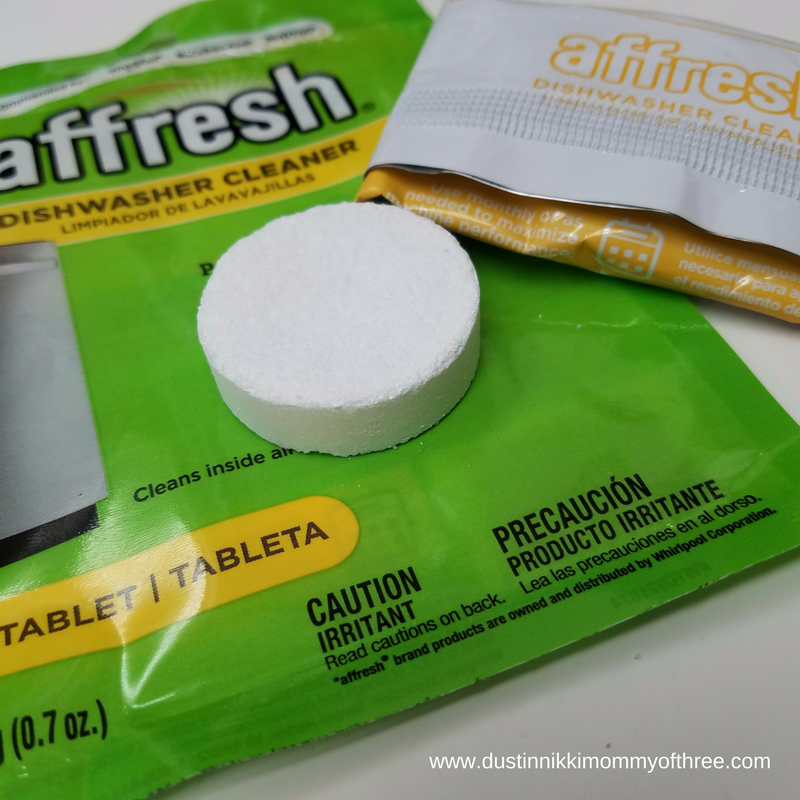 If you are cleaning your dishwasher without dishes, then you can place the tablet in the detergent tray. I chose to clean my dishwasher without dishes. All I had to do was place a tablet in the detergent tray and then run a normal wash cycle. 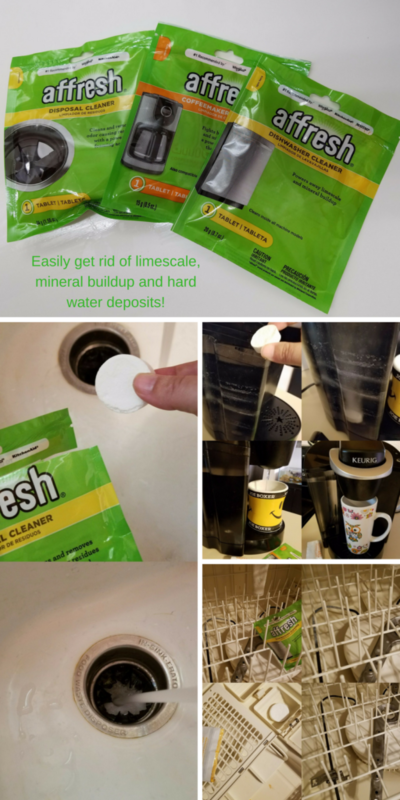 If you have a lot of limescale and mineral buildup, you can use two tablets. 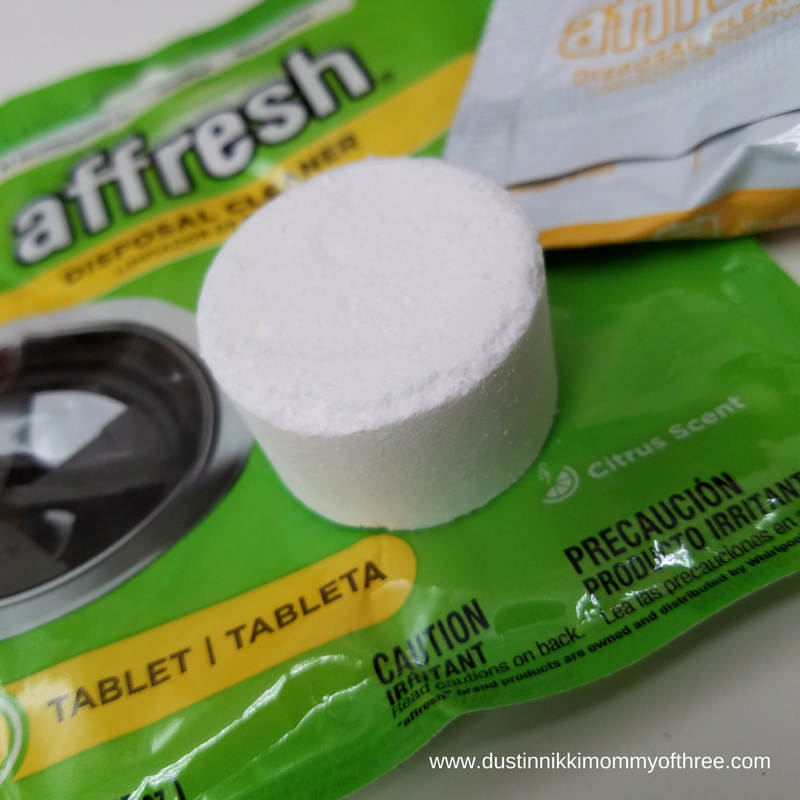 If you use two, you definitely want to clean it without a load of dishes in there because you will place a tablet in the detergent tray and a second one in the bottom floor of the dishwasher. One tablet did it for mine. As you can see in the above picture, you can see the buildup on some of the metal parts such as the heating element. After the wash, they were pretty clean. I was really impressed. I didn’t even have to wipe anything off myself either. I couldn’t believe the difference. Oh, and my glasses and dishes look more clean too. I used to think it was just my detergent leaving spots but after I cleaned my dishwasher, my glasses didn’t have any more spots. And yes, I am still using the same detergent before and after. 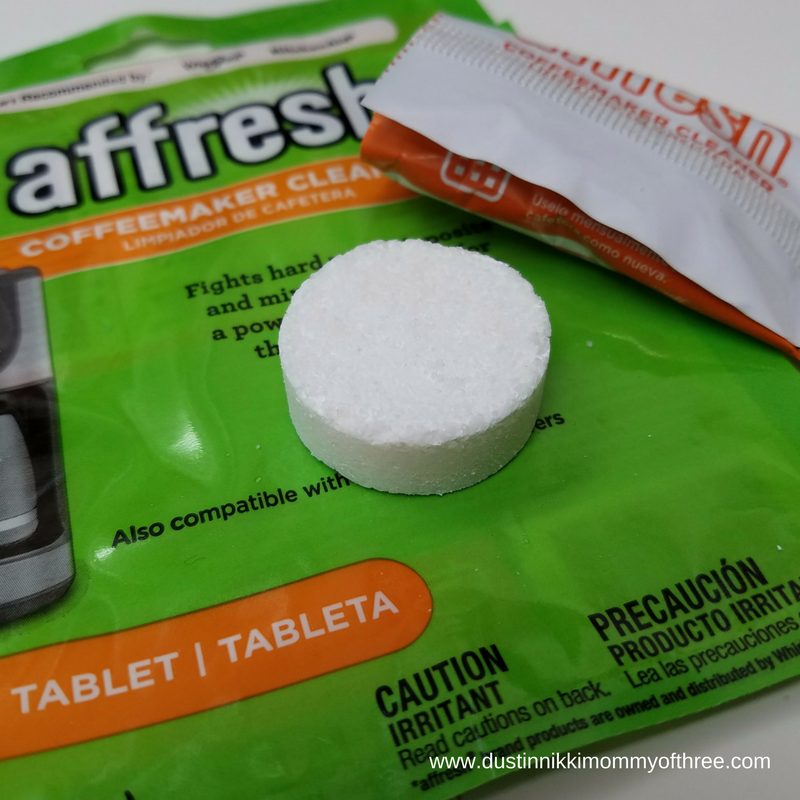 The second product I tried was the Coffeemaker Cleaner. This cleaner helps remove hard water deposits and mineral buildup and has a powerful clean without the odor of vinegar. 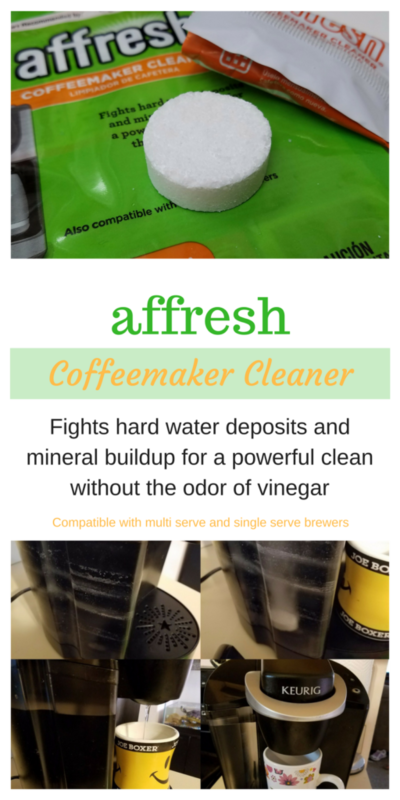 This cleaner can be used with multi cup brewers and single cup brewers as well. We have a problem with hard water and it is definitely noticeable sometimes. I have a Keurig and you can see the residue lines on the inside of the reservoir. Every time I need to refill the reservoir, I always rinse it out and clean the inside of it out. Sometimes it’s a little difficult to get it all off. That was until I tried this product. Also, I can only imagine what our hard water does to the inside of my brewer. The cleaning instruction for either type of coffeemaker is really easy to follow. For my single cup machine, I filled the water reservoir to the max fill line. Then I turned the machine on and waited for it to be ready while making sure my k-cup compartment was empty. When the machine was ready, I dropped one tablet into the reservoir. You can see it bubbling/fizzing once you drop it in. After the tablet is finished fizzing, then you push the large cup option and run it through a brew cycle. Once the cycle is done, empty the water from the cup. Then run one more brew cycle, once again emptying the cup. Once you have ran at least two cycles, empty the reservoir and fill again with clean water. Run another two cycles with the clean water to rinse the coffeemaker. I did an extra cycle for good measure so I did three rinse brews instead of two. Before I filled the water back up with clean water, I rinsed the reservoir and wiped out the inside of the reservoir. There was absolutely no scrubbing those residue lines. I literally just wiped them out. I have never been able to get rid of that residue that easily before. 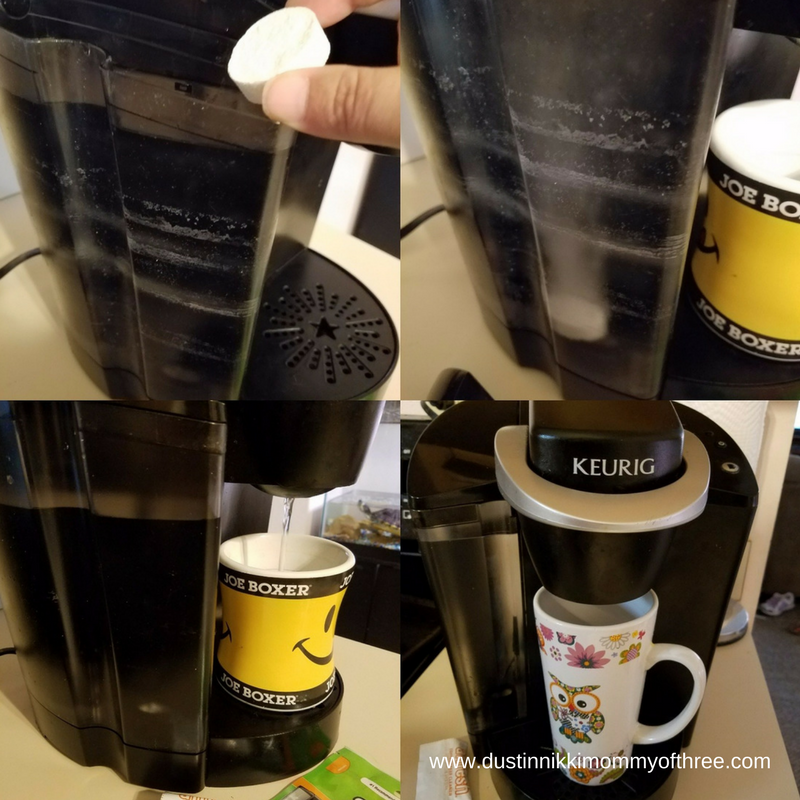 After cleaning my Keurig, I found that my coffee brewed a lot better and I ended up having better tasting coffee or tea. And the best part? The cleaner doesn’t have a smell to it! Last but not least is the Disposal Cleaner. This cleaner cleans and removes odor causing residues with a powerful foaming action. Unlike the other two cleaners I have mentioned above, this one has a scent. It has a very pleasant citrus scent. The directions are simple. Run a low flow of hot water in your sink. While the water is running, drop the tablet into the disposal. Then turn on your disposal for about 20-30 seconds. While doing this, foam will most likely rise. That’s one of the things I like about it. The cleaner foams and comes up a bit to even clean around the top of the drain as well. After running the disposal for 20-30 seconds, turn it off. Then just rinse away the foam and cleaner residue down the drain. 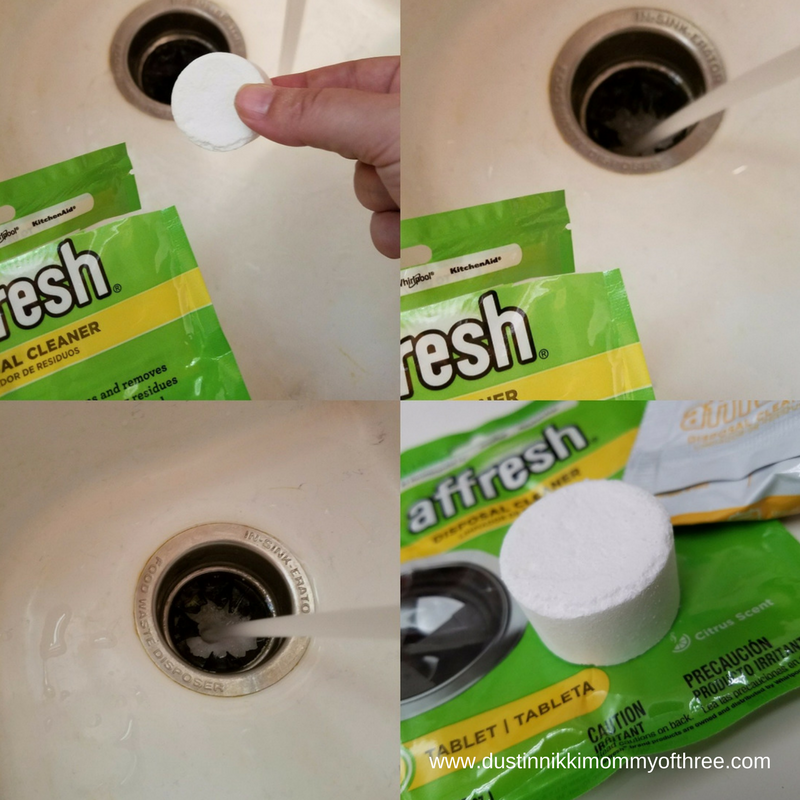 After I rinsed it all down, I was also able to easily wipe away grime around my drain and sink. One thing I don’t like about a disposal is getting a smell in your drain. Who wants a smelly sink? Not me, that’s for sure. I loved how well this cleaner cleaned my disposal. It cleans well, got rid of the nasty’s that was making a smell and the cleaner itself has a great fresh scent too. It’s not a really strong scent, it’s light and pleasant. No more stinky sinky! I absolutely love these cleaners. 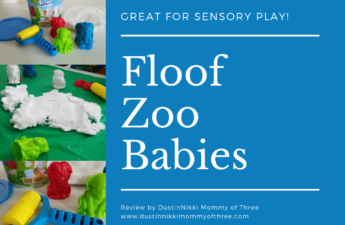 They are really easy to use and they work great! Buy It: Visit affresh website for product information and information about their other products as well. You can buy online and also find out where to buy in the store. 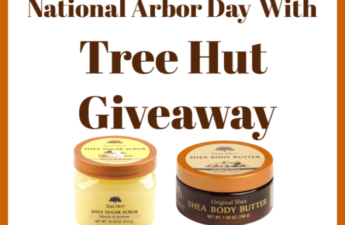 Definitely worth checking out in my opinion! About Crowdtap – Crowdtap is a site that is free to join. You can complete sharing tasks that are simple to complete for all kinds of brands. Some of the brands even have prizes you can win by completing tasks. But you earn overall points for completing things and after you earn enough points, they send you gifts cards such as Amazon. They also have sampling mission opportunities you can apply for. If you are selected for one, you will be sent a kit with samples and products (usually full size) so you can try them. And it’s all free. All you have to do is complete sharing tasks/reviews and complete the sampling mission before it’s due date to stay eligible for more opportunities. Tasks vary from mission to mission. 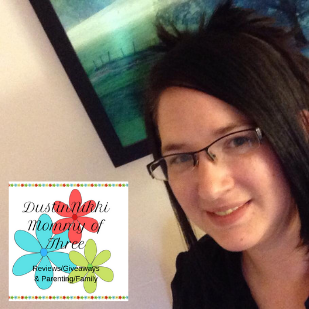 Find out more by visiting Crowdtap and you can also check out my previous posts and reviews HERE. Disclaimer: I received complimentary affresh products to facilitate my review as part of an incentivized sampling for Crowdtap. All opinions are my own.